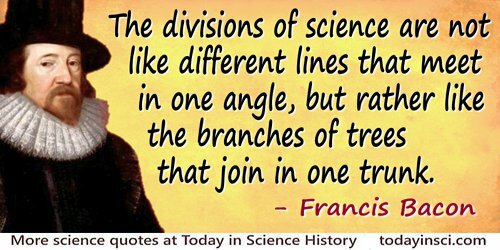 English philosopher remembered for his influence promoting a scientific method. 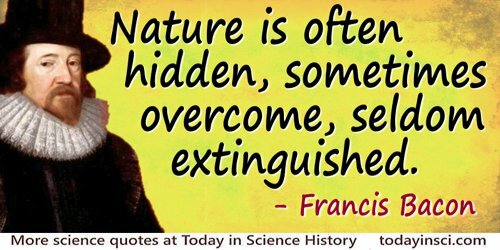 He held that the aim of scientific investigation is practical application of the understanding of nature to improve man's condition. '...no pleasure is comparable to the standing upon the vantage ground of truth … and to see the errors … in the vale below:' so always that this prospect be with pity, and not with swelling or pride. Quoting an unnamed poet and adding a comment. Francis Bacon, Basil Montagu (Ed. ), The Works of Francis Bacon (1852), Vol. 1, 173. 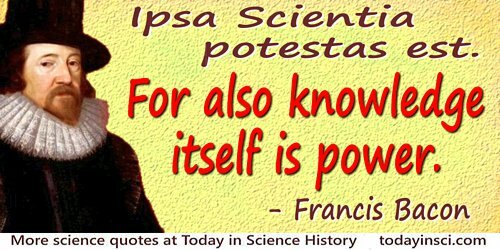 ...to invent is to discover that we know not, and not to recover or resummon that which we already know. Novum Organum, I., 70. In Thomas Benfield Harbottle, Dictionary of Quotations (Classical) (1906), 42. 'Meditationes Sacrae' (1597), in James Spedding, Robert Ellis and Douglas Heath (eds. ), The Works of Francis Bacon (1887-1901), Vol. 7, 253. A prudent question is, as it were, one half of wisdom. In Henry Thomas Riley, Dictionary of Latin Quotations, Proverbs, Maxims, and Mottos (1866), 349. 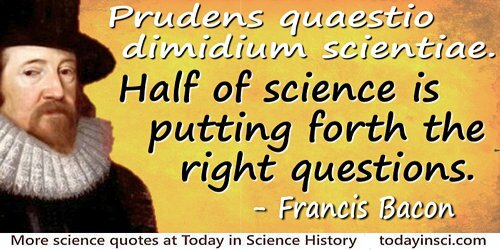 Half of science is putting forth the right questions. In Jon R. Stone, The Routledge Dictionary of Latin Quotations (2005), 92. In James Wood, Dictionary of Quotations from Ancient and Modern, English and Foreign Sources (1893), 383:3. ‘Of Youth and Age’, Essays. 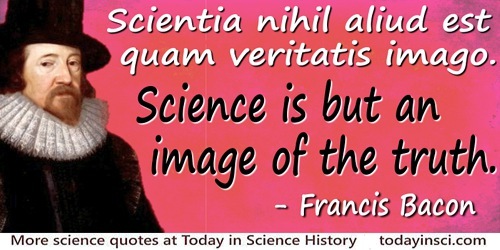 All depends on keeping the eye steadily fixed on the facts of nature and so receiving their images simply as they are. In Francis Bacon, James Spedding (ed. ), Robert Leslie Ellis (ed. ), 'The Plan of the Work: The Great Instauration', The Works of Francis Bacon: Translations of the Philosophical Works (1858), Vol. 4, 32. In The Advancement of Learning, book 2, xxii, 14. In Francis Bacon and Basil Montagu, The Works of Francis Bacon (1825), 252. In 'A Collection of Apophthegms, New and Old' (1625). As given in Essays, Moral, Economical, and Political: A New Edition, With the Latin Quotations Translated (1813), No. 271, 341. 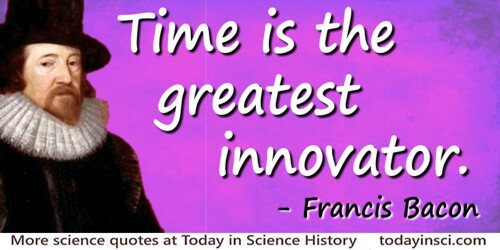 As the birth of living creatures are ill shapen; so are all innovations, which are the births of time. From essay, 'Of Innovations'. As collected and translated in The Works of Francis Bacon (1765), Vol. 1, 479. As the births of living creatures are ill-shapen, so are all innovations, which are the births of time. In 'A Proposal for Amending the Laws of England' (1616). Collected in The Works, with Several Additional Pieces Never Before Printed (1740), Vol. 4, 5. 'Apophthegms From the Resuscitatio' (1661). In Francis Bacon, James Spedding, The Works of Francis Bacon (1860), Vol. 13, 391. From Novum Organum (1620), Book 1, Aphorism 3. Translated as The New Organon: Aphorisms Concerning the Interpretation of Nature and the Kingdom of Man), collected in James Spedding, Robert Ellis and Douglas Heath (eds. ), The Works of Francis Bacon (1857), Vol. 4, 47. Letter (age 31) to his uncle Lord Burleigh. In Francis Bacon, James Spedding (ed.) et al., Works of Francis Bacon (1862) Vol. 6, 109. The Advancement of Learning (1605) in James Spedding, Robert Ellis and Douglas Heath (eds. ), The Works of Francis Bacon (1887-1901), Vol. 3, 293. Translation in Francis Bacon, James Spedding (ed.) et al., Works of Francis Bacon (1858) Vol. 6, 498. If the just cure of a disease be full of peril, let the physician resort to palliation. Nat. Hist. As quoted in entry for 'Palliation', Samuel Johnson, A Dictionary of the English Language; in which the Words are Deduced from their Originals (1818), Vol. 3 (unpaginated). Translation in Francis Bacon, James Spedding (ed.) et al., Works of Francis Bacon (1858) Vol. 6, 401. It is as natural to man to die as to be born; and to a little infant, perhaps, the one is as painful as the other. Of Death. In Carl Sagan, Broca’s Brain: Reflections on the Romance of Science (1979, 1986), 206. From Novum Organum (1620), Book 1, Aphorism 6. Translated as The New Organon: Aphorisms Concerning the Interpretation of Nature and the Kingdom of Man), collected in James Spedding, Robert Ellis and Douglas Heath (eds. ), The Works of Francis Bacon (1857), Vol. 4, 48. It would be the height of folly—and self-defeating—to think that things never heretofore done can be accomplished without means never heretofore tried. Bacon's original text is in Latin, so any quote seen in English is an interpretation by the translator. The dictum, expressed in three words as 'Knowledge is Power,' is only seen in notes to the texts made by translators or editors, and is not a direct translation of Bacon's written words. See, for example, the commentary by F. G. Selby (ed.) in The Advancement of Learning, Book 1, by Francis Bacon (1905), 140; or, the introductory notes by E. A. Abbott (ed.) in Bacon's Essays (1876), cxxxvii. For the best match in Bacon's original words, see Novum Organum Aphorism 3: Scientia et potentia humana in idem coincidunt,... or 'Human knowledge and human power meet in one;...'. The Latin form is in Thomas Fowler (ed. ), Bacon's Novum Organum (2nd Ed., 1878), 188; and this translated form is in Francis Bacon and James Spedding (trans. ), The Works of Francis Bacon (1864), Vol. 8, 67. Man, as the minister and interpreter of nature, is limited in act and understanding by his observation of the order of nature; neither his understanding nor his power extends further. From Novum Organum (1620), Book 1, Aphorism 1. Translated as The New Organon: Aphorisms Concerning the Interpretation of Nature and the Kingdom of Man), collected in James Spedding, Robert Ellis and Douglas Heath (eds. ), The Works of Francis Bacon (1857), Vol. 4, 47. Men are rather beholden ... generally to chance or anything else, than to logic, for the invention of arts and sciences. The Advancement of Learning (1605) in James Spedding, Robert Ellis and Douglas Heath (eds. ), The Works of Francis Bacon (1887-1901), Vol. 3, 386. Surely every medicine is an innovation, and he that will not apply new remedies must expect new evils for time is the greatest innovator. The art of invention grows young with the things invented. Quoted by Bacon as a Maxim. As given in Gurney Benham, A Book of Quotations, Proverbs and Household Words (1907), 494. The cause and root of nearly all evils in the sciences is this—that while we falsely admire and extol the powers of the human mind we neglect to seek for its true helps. From Novum Organum (1620), Book 1, Aphorism 9. Translated as The New Organon: Aphorisms Concerning the Interpretation of Nature and the Kingdom of Man), collected in James Spedding, Robert Ellis and Douglas Heath (eds. ), The Works of Francis Bacon (1857), Vol. 4, 48. The End of our Foundation is the knowledge of Causes; and secret motions of things; and the enlarging of the bounds of Human Empire, to the effecting of all things possible. 'New Atlantis' (1626) in James Spedding, Robert Ellis and Douglas Heath (eds. ), The Works of Francis Bacon (1887-1901), Vol. 3, 156. The lame … in the path outstrip the swift who wander from it. In Novum Organum, as collected and translated in The Works of Francis Bacon: Lord Chancellor of England (1831), 43. ‘Of Seditions and Troubles’, Essays. There are, and can be, but these two ways of seeking truth; the former, the anticipatory, is the one now in use; the latter is the true but yet untried path. Cited as Aphorism 19 in book review 'A Preliminary Discourse on the Study of Natural Philosophy' in The Quarterly Review (Jul 1831), 45, No. 90, 399. This appears to be an abridged version of Aphorism 20 shown on this web page. There is nothing more certain in nature than that it is impossible for any body to be utterly annihilated. Sylva Sylvarum; or a Natural History in Ten Centuries (1627), Century 1, Experiment 100. Collected in The Works of Francis Bacon (1826), Vol 1, 285. The Advancement of Learning (1605) in James Spedding, Robert Ellis and Douglas Heath (eds. ), The Works of Francis Bacon (1887-1901), Vol. 3, 355. Truth more easily comes out of error than out of confusion. As quoted by Thomas Huxley, Address delivered to the Working Men's Club and Institute, 'Technical Education' (1 Dec 1877), in Nineteenth Century (1878), 65-85. Collected in Science and Culture, and Other Essays (1881), 66. 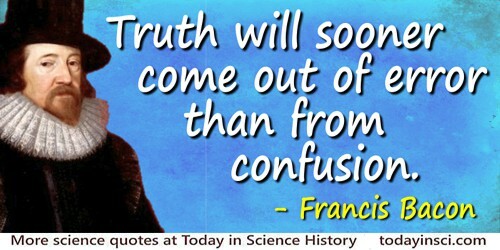 …truth will sooner come out of error than from confusion. From Novum Organum (1620), Book 2, Aphorism 20. Translated as The New Organon: Aphorisms Concerning the Interpretation of Nature and the Kingdom of Man), collected in James Spedding, Robert Ellis and Douglas Heath (eds. ), The Works of Francis Bacon (1857), Vol. 4, 149. I worked on true Baconian principles, and without any theory collected facts. 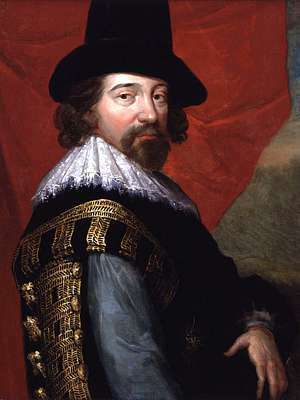 22 Jan - short biography, births, deaths and events on date of Bacon's birth.